Andy Hall studio view: silk study model with research materials and template. Photo courtesy the artist. In Outdoor Activity for George Kubler, Chicago-based artist Andy Hall playfully examines Kubler’s notion of useful inventions vs. artistic inventions. Over the duration of Northern Spark a large bolt of raw Habotai Silk will be transformed into an array of vibrantly colored painted textiles. The textiles will be steam set, sewn into a series of iconic tote bags, and strung up above the site for display and dispersal. 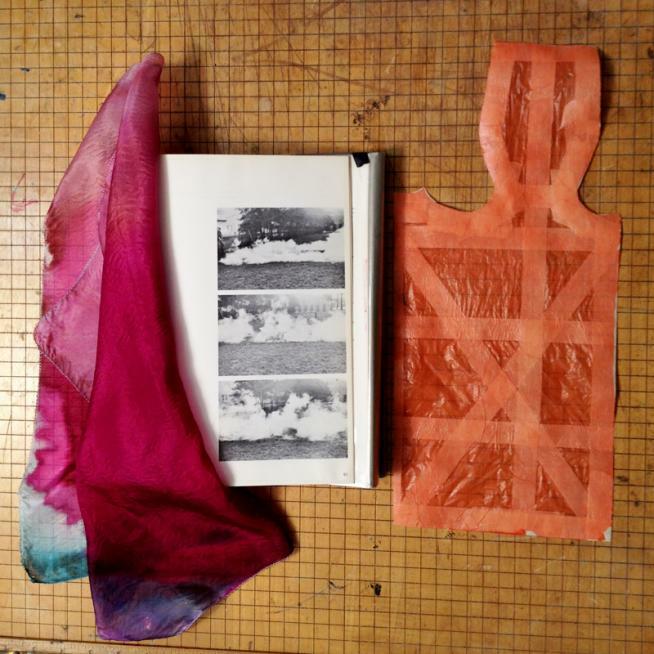 Dye will be actively applied to the silk by the artist in collaboration with festival participants, using methods that stimulate an awareness of bodily possibility, the physical nature of the materials, the temporal dimensions of process, and the perception of the maker. The resulting gestures will be placed into a long steam chamber to set the dye. The steam-set-material will be sewn into a series of forms based on the ubiquitous plastic shopping bag. The assembly line-like installation, beginning with raw material and dispensing vividly colored silk totes, help asks questions about process, material quality, and product. The American Craft Council celebrates the connection between the makers, the materials, and the enthusiasts whose lives are enriched by unique, handmade works of art. Made possible by the Minnesota State Arts Board and the Windgate Charitable Foundation.